Above: Santa hats for everyone! 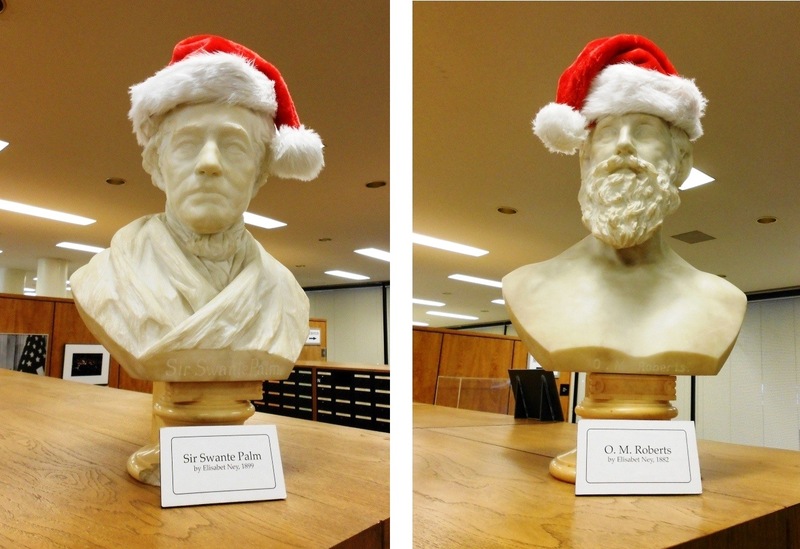 Even in the Briscoe Center, which houses the UT Archives, the marble busts of Swante Palm and Oran Roberts are decked out for the holidays. Swante Palm was a Swedish immigrant to Austin who in 1897 willed most of his 12,000 volume library to the University. As Texas governor, Oran Roberts oversaw the passing of legislation to create UT and for a time served as a law professor. The busts were created in 1899 by Austin sculptor Elizabeth Ney, and were the first gifts to the University by the alumni association. It’s the season! While the week after Thanksgiving is fraught with due dates for research papers, a last round of tests, and with final exams looming, the campus still finds ways to get in the holiday spirit. 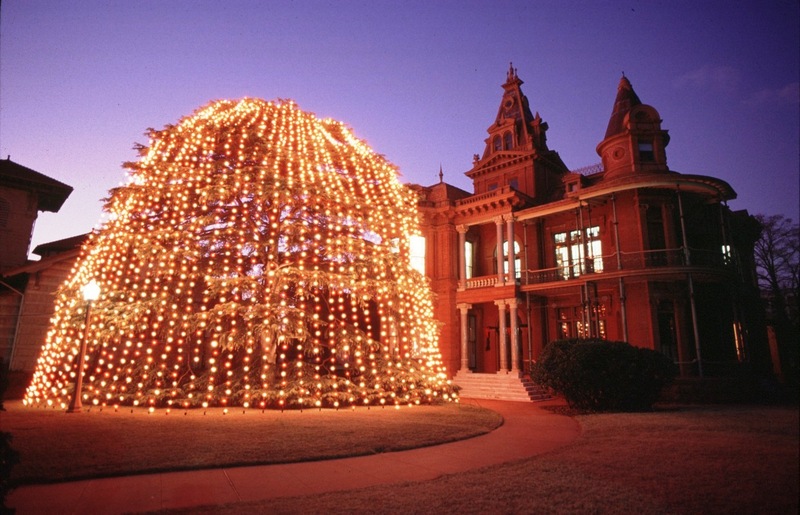 A Texas-sized, eight-foot Menorah is placed on the West Mall to celebrate Hanukkah, enormous Christmas trees grace the lobbies of the Texas Union and Student Acitivity Center, and strings of lights, wreaths, and other decorations are scattered throughout the campus, including a “book tree” found in the Perry-Castaneda Library (photo at left). 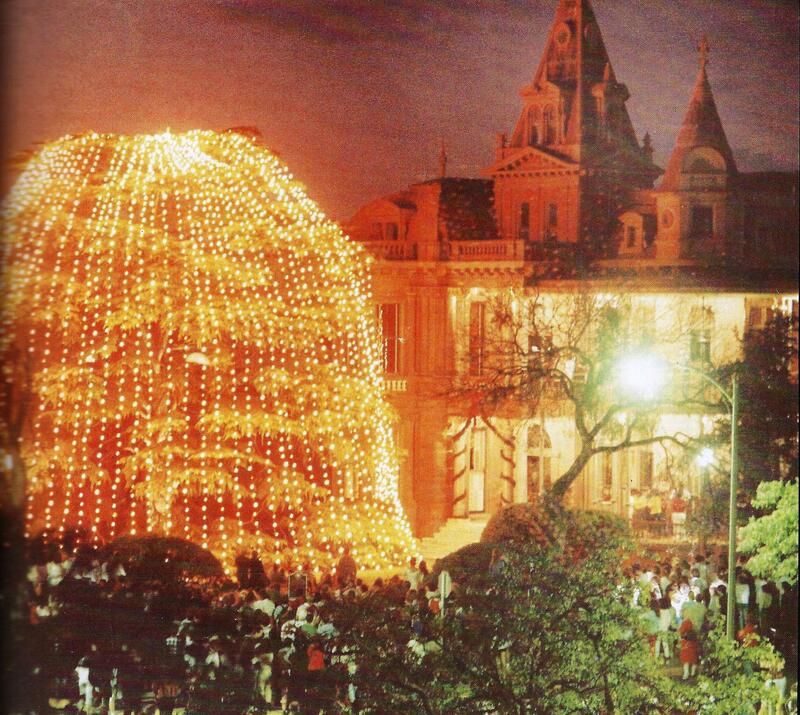 In 1987, perhaps inspired by Austin’s popular Zilker Park Christmas tree, the University unveiled it’s own official “Holiday Tree.” The giant cedar that still grows next to the Littlefield Home was chosen for the honor. The tree was planted in the mid-1920s, a few years after George Littlefield had passed, by his niece who had moved in to the house to look after her surviving Aunt Alice. Cranes were needed to install strands of several thousand orange and white lights placed over the top of the tree and anchored to the ground. On Tuesday, December 1st, just before dusk on a clear evening, a tree lighting ceremony featured the Longhorn Band, the Innervisions Gospel Choir, and UT President Bill Cunningham. From a distance, the Holiday Tree resembled something like a huge orange gumdrop. 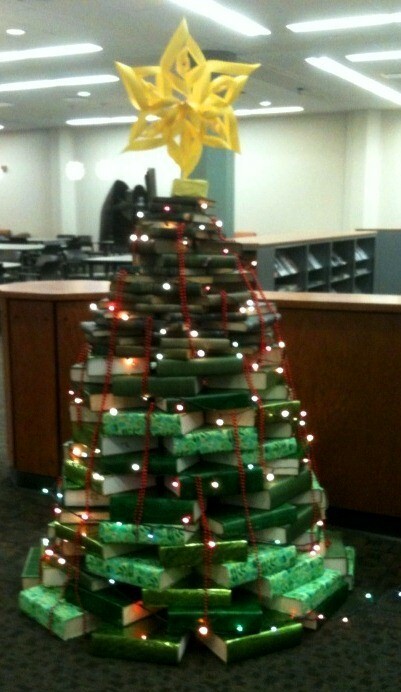 Unfortunately, the tradition of the Holiday Tree was short-lived, and only survived about five years. 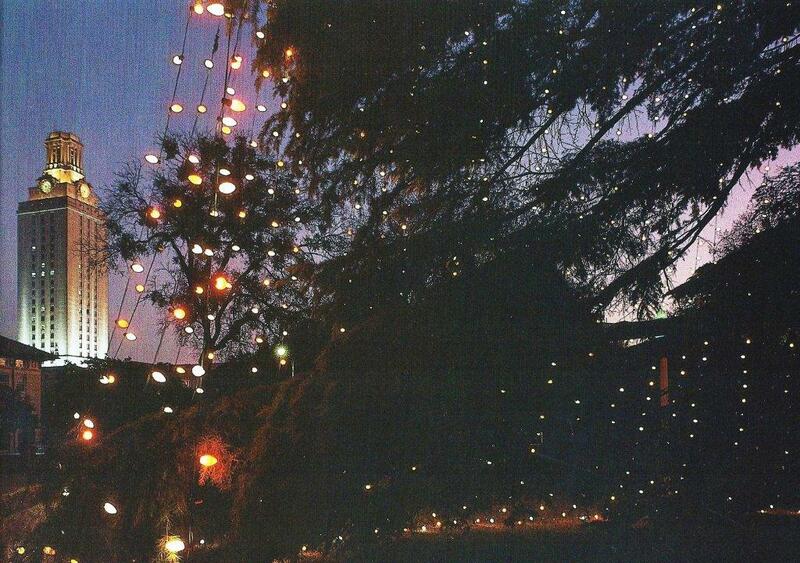 The weight of the lights and heat from the bulbs were found to be overly stressful for the great cedar, and the practice was discontinued in the early 1990s. 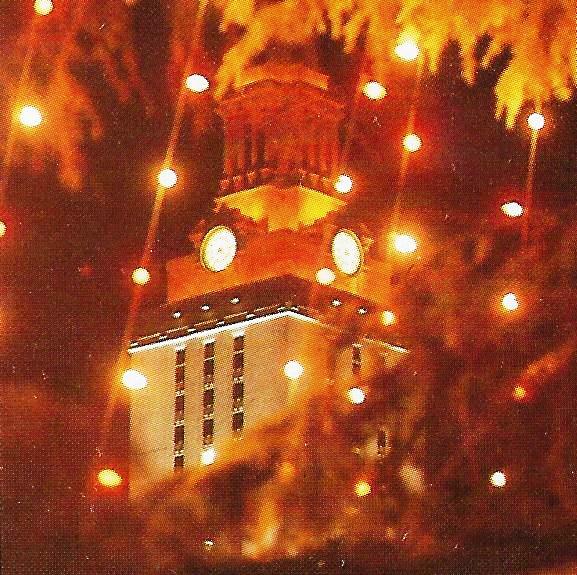 A view from behind the tree, looking through the lights and up to the UT Tower. This entry was posted in Uncategorized and tagged George, Gracy, Holiday, Jim Nicar, Littlefield, Tree by jimnicar. Bookmark the permalink. Didn’t know about the Littlefield gumdrop tree.